Synonyms and Other Names: Pygocentrus altus Gill 1870, Serrasalmo ternetzi Steindachner 1908, Serrasalmus nattereri (Kner 1858); red-bellied piranha. Identification: Some United States specimens misidentified as members of this species may actually have been closely related species, the Orinoco piranha (Pygocentrus notatus). Pacus (Colossoma and Piaractus) also have been misidentified frequently as piranhas but may be distinguished by the shape of the teeth (sharp, incisor-like in piranhas vs. molariform in pacus). Fink (1993) reviewed the genus Pygocentrus and provided a key and photographs. Native Range: Tropical America. Widely distributed in lowland areas of central and southern South America east of the Andes, including the Amazon and Parana basins and various coastal drainages of the Guianas and Brazil (Fink 1993). Table 1. States with nonindigenous occurrences, the earliest and latest observations in each state, and the tally and names of HUCs with observations†. Names and dates are hyperlinked to their relevant specimen records. The list of references for all nonindigenous occurrences of Pygocentrus nattereri are found here. Ecology: Pygocentrus nattereri is a schooling predator that consumes live fishes whole or by removing portions of fin, scales, or muscle. It also feeds on crustaceans, insects, molluscs, and plant material (Sazima and Machado 1990). Additionally, this species is known to scavenge, feeding on dead and/or decaying fishes, birds, mammals, and occasionally human corpses (Sazima and Guimarães 1987; Sazima and Machado 1990). Bennett et al. (1997) estimated a chronic thermal minimum of 10°C. Status: Failed in all states. Remarks: This species is the most common piranha in the aquarium trade. Although P. nattereri is considered one of the more aggressive piranha species, many experts consider its danger to humans to be greatly exaggerated and its reputation as a man-eater may be derived from scavenging on human corpses (Sazima and Guimarães 1987). Nevertheless, considerable care must be taken in handling live individuals. Import is prohibited in many southern states (e.g., Florida and Texas). Single or multiple P. nattereri have been found in ponds, lakes, rivers, and borrow pits. In northern states, reports are typically of fish taken by hook and line during the summer or found dead during the cooler months. The reaction by some state agencies has been to rotenone the entire waterbody in which the piranha was taken. This fish has small chance of surviving cold periods. 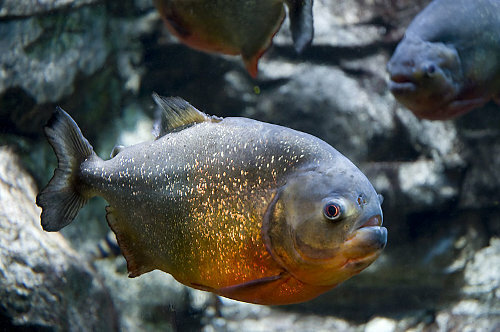 A fish taken from the Elk River, Alabama, previously reported in a newspaper account as a red piranha (Middleton 1988), has been shown to be the pacu, Piaractus brachypomus (museum specimen). The piranha taken from Duban Lake, Minnesota, was originally misidentified by local biologists as being a pacu. Reports of piranhas taken from the Tamiami Canal in south Florida during the period 1969-1979 were unconfirmed (Courtenay and Hensley 1979), and none were taken there by Loftus and Kushlan (1987) and subsequent collectors. Voucher specimens: California (LACM 44523.001), Florida (UF 97062), Hawaii (UMMZ 220369), Massachusetts (MCZ 57904, NUVC uncatalogued), Minnesota (UF 98887; JFBM 30193), Oklahoma (UF 96188), Texas (uncatalogued, Texas Parks and Wildlife Department), and Virginia (uncatalogued, Virginia Department of Game and Inland Fisheries, Virginia Beach). Bennett, W.A., R.J. Currie, P.F. Wagner, and T.L. Beitinger. 1997. Cold tolerance and potential overwintering of the red-bellied piranha Pygocentrus nattereri in the United States. Transactions of the American Fisheries Society 126:841-849. Courtenay, W.R., Jr. - Florida Atlantic University (retired), Boca Raton, FL. Courtenay, W.R., Jr., D.P. Jennings, and J.D. Williams. 1991. Appendix 2: Exotic fishes. Pages 97-107 in Robins, C.R., R.M. Bailey, C.E. Bond, J.R. Brooker, E.A. Lachner, R.N. Lea, and W.B. Scott, eds. Common names and scientific names of fishes from the United States and Canada. 5th edition. American Fisheries Society. Bethesda, MD. Devick, W.S. - Division of Aquatic Resources, Hawaii Department of Land and Natural Resources, Honolulu, Hawaii. Duponchelle, F., F. Lino, N. Hubert, J. Panfili, J.-F. Renno, E. Baras, J.P. Torrico, R. Dugue, and J. Nuñez. 2007. Environment-related life-history trait variations of the red-bellied piranha Pygocentrus nattereri in two river basins of the Bolivian Amazon. Journal of Fish Biology 71:1113-1134. Fink, W.L. 1993. Revision of the piranha genus Pygocentrus (Teleostei, Characiformes). Copeia 1993(3):665-687. Moreno, D. - Cleveland Metroparks Zoo, Cleveland, OH. Queiroz, H.L., M.B. Sobanski, and A.E. Magurran. 2010. Reproductive strategies of red-bellied piranha (Pygocentrus nattereri Kner, 1858) in the white waters of the Mamirauá flooded forest, central Brazilian Amazon. Environmental Biology of Fishes 89:11-19. Radtke, R.L. 1995. Forensic biological pursuits of exotic fish origins: piranha in Hawaii. Environmental Biology of Fishes 43:393-399. Sazima, I. and S. de Andrade Guimarães. 1987. Scavenging on human corpses as a source for stories about man-eating piranhas. Environmental Biology of Fishes 20(1):75-77. Sazima, I., and F.A. Machado. 1990. Underwater observations of piranhas in western Brazil. Environmental Biology of Fishes 28:17-31. Schainost, S. - Rivers and Streams Program, Nebraska Game and Parks Commission, Lincoln, NE. Stone, S. 1987. 6-inch prianha found in pit at Indian Lakes. Virginia Pilot and Ledger Star, 23 August 1987. Stroud, R.A. 1976. Ohio piranha. Sport Fishing Institute Bulletin 272:3. Uetanabaro, M., T. Wang, and A.S. Abe. 1993. Breeding behaviour of the red-bellied piranha, Pygocentrus nattereri, in nature. Environmental Biology of Fishes 38:369-371.